Remember we spoke about master cutter John DeBoise in the Blake London article? Well here's John in action in a film by old friends Cad and the Dandy. Ah, the sound of scissor on cloth. And some Westminster chimes thrown in for good measure. Music to Tweedy's ears. Notice the hand-sewn button holes. Very important. Tweedy's Thought: Are there any tailoring people out there who would like to show their skills to our readers? They're hungry for knowledge. Please get in touch and help us demonstrate why quality and craftsmanship matter. Take a look at www.thomsweeney.co.uk and click on the services link. 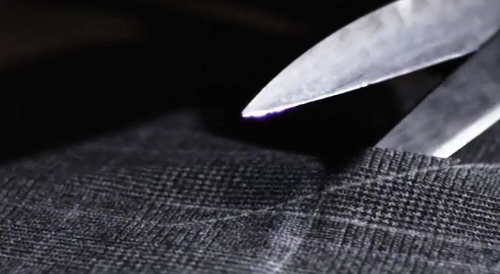 There's a lovely sped up video of a jacket being made. Thanks. Take a look at the article we did on Thom Sweeney: http://goo.gl/dxs06. Always looking for follow-ups though, so please send in any intelligence you have.